Do you want to add captions to your images in WordPress? Captions are brief text descriptions that you can add to your images. They are typically used to provide additional details about an image. 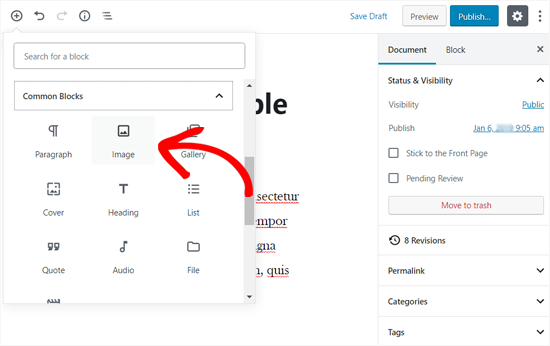 WordPress comes with the built-in capability to easily add a caption and other metadata including title and alternative text for each image. 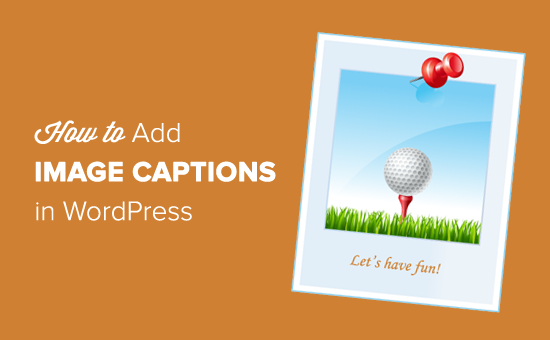 In this beginner’s guide, we will show you how to easily add a caption to images in WordPress. The first thing you need to do is to upload an image. On the post edit screen, click the ‘Add Block’ icon and select the ‘Image’ block. Upon clicking on it, the Image block will be added to your post area. 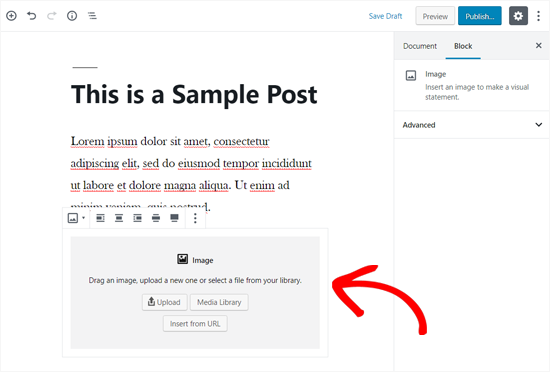 You can now click on the upload button to select and upload an image from your computer to WordPress. 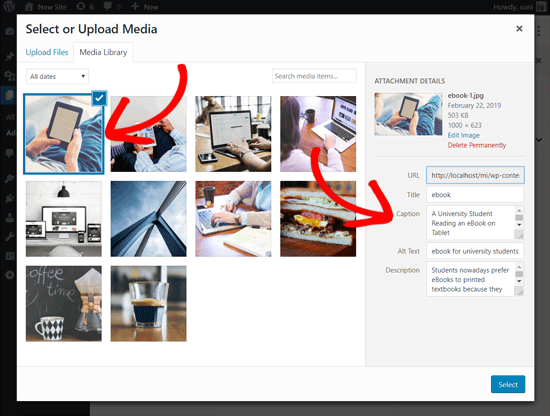 You can also select a previously uploaded image by clicking on the media library button. 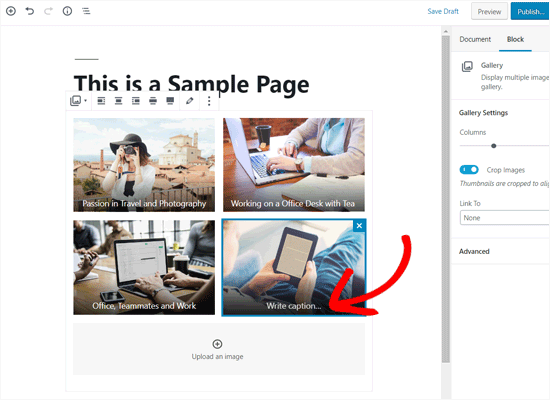 To learn more, see our article on how to add and align images in WordPress. 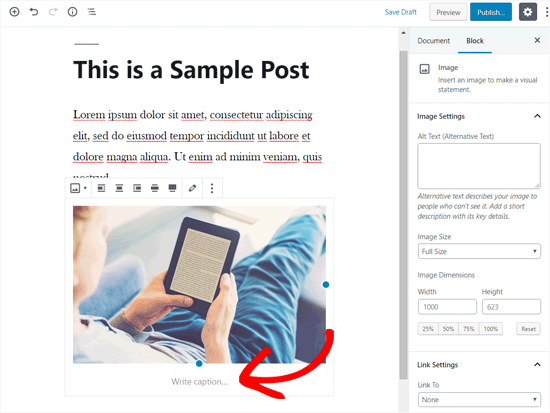 As soon as you add an image, it will appear inside the editor with a text box labeled ‘Write caption…’ below it. That’s where you can add a caption for your image. Once done, you can save your post by clicking on the publish or update button. That’s all. Wasn’t that easy? 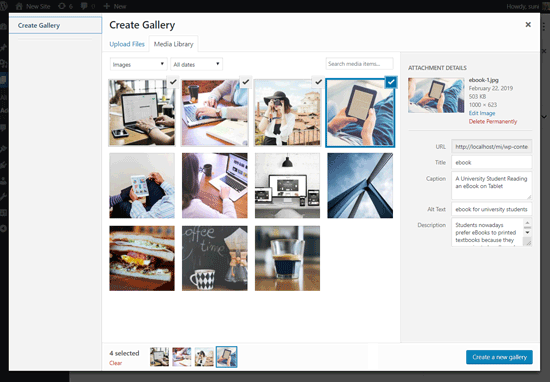 WordPress editor also comes with a Gallery block allowing you to upload multiple images and display them in a grid layout with rows and columns. Let’s see how to add captions to images in a WordPress gallery block. To create a gallery, go to your page or post edit screen. Then click the ‘Add Block’ icon and select the ‘Gallery’ block in the Common Blocks tab. Next, you will see the Gallery block added to your page/post area. 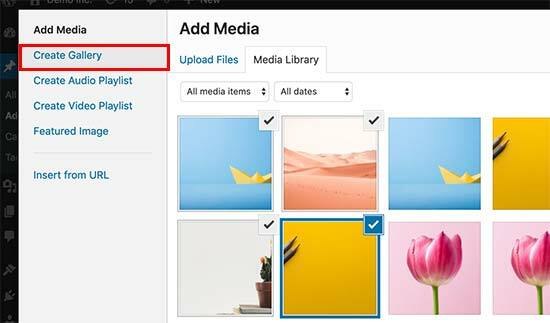 Now, you can upload images one by one from your computer or select the pre-uploaded pictures from your media library. If you upload images individually, then you can add a caption after uploading each one. When an image is uploaded, simply click on the image and the ‘Write caption…’ field will appear. You can add a caption by clicking on that. If you select pre-added images from the library, you can add a caption to your pictures from the image metadata section on the right. If the photos already have a caption, then you don’t need to add it again. 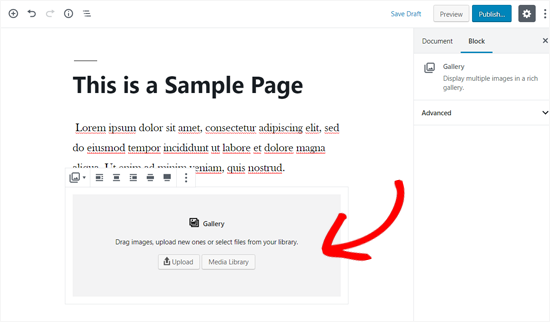 WordPress allows you to upload images directly to the media library without embedding it in a post or page. 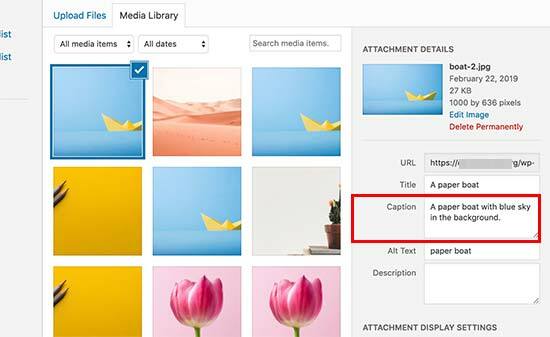 Here we will show you how to add caption to images when uploading them directly to the Media Library. First, you need to visit Media » Add New page in WordPress admin area. From here, you can upload an image by dragging and dropping or by selecting one from your computer. 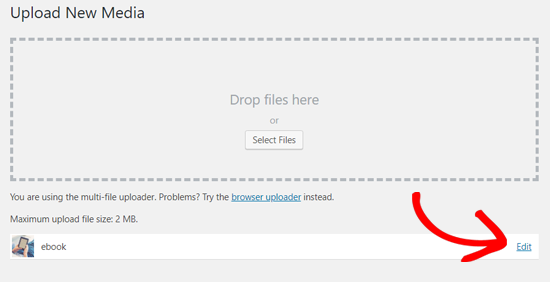 Once done, you will see the uploaded image below the Upload New Media box. You need to click the ‘Edit’ link. Next, it’ll open the edit media page in a new tab. You may notice that the edit media screen looks similar to the post edit screen. That’s because WordPress treats attachment (for example, image) as a default post type. This allows it to store image metadata like title, description, and caption in WordPress database. From this screen, you can edit your image title, add image metadata including caption, alternative text, and description. Once you add the necessary information, you can update your image. This image metadata will now be saved in your media library. You can add this image on as many posts as you like without having to add the caption and other metadata again. Whenever you add this image to your post from the media library, it comes with the metadata already saved. 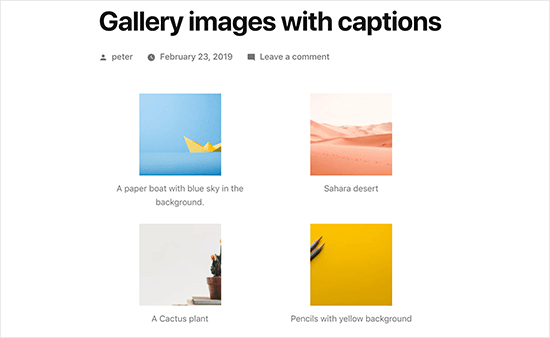 If you are still using the old Classic Editor on your WordPress site, then this is how you would add captions to images in WordPress. 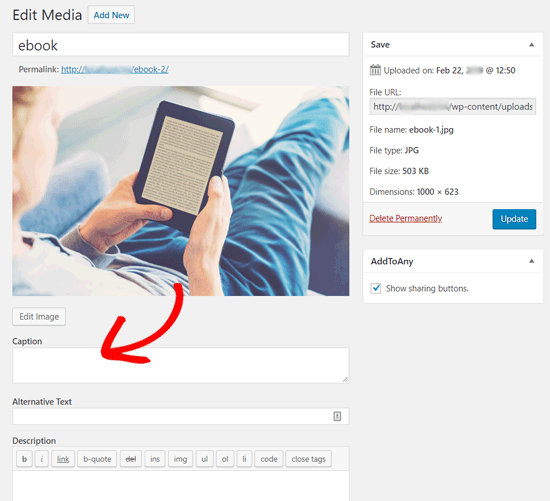 Simply click on the Add Media button above the post editor to upload an image or select one from the media library. Once the image is uploaded you can enter meta data like title, alt text, and a caption of your image. Click on the ‘Insert into post’ button to add the image to your post or page. You will now be able to see the image preview in your post editor with the caption. You can save your changes and preview the post to see how it would look on your live site. You can also add captions to images when creating a gallery using the Classic Editor. Simply upload and select multiple images and then click on the ‘Create gallery’ link from the left column. After that, you will need to click on the ‘Create a new gallery’ button at the bottom right corner of the popup. Now you will be able to add captions directly below each image or click on an image to load its settings in the right column and then add the caption. 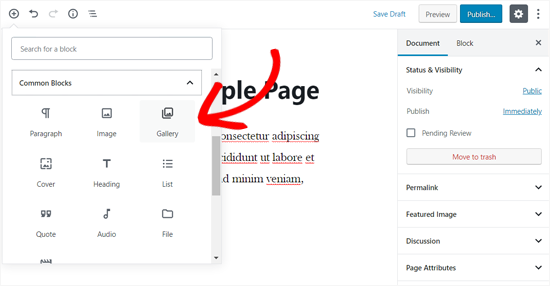 You can now click on the Insert Gallery button to add gallery into your WordPress post or page. 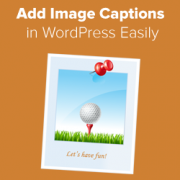 We hope this article helped you to add caption text to your images in WordPress. If you liked this article, you might also want to see our guide on how to fix common image issues in WordPress. Hey there, I want to add a caption to gallery images, but what if I don’t want the black gradient at the bottom of my images that holds the caption? I prefer the caption to be in white and below the image. How do I do this? Thank you! That would be determined by your theme’s CSS so you would want to either reach out to your theme’s support or you can use a gallery plugin to style it differently than what your theme has set. How can I show the caption for pictures in the Upload / Media Library pop-up? We have to wade through hundreds of pictures of products that look rather similar and without the caption or title it is almost impossible to find the correct one to insert; clicking one only gives the Select option but shows no details. Hovering caption plugins only work on the frontend. Unless I hear otherwise we do not have a recommended plugin for adding the caption in the insert area. If you are not already, you should be able to upload the image in the post/page/custom post type and set the caption there rather than uploading directly to your media library. Do you know how to add classes to the figure element if the image has a caption? You can use the advanced area to add CSS classes to the image but you would need to use the HTML editor if you wanted to add other specific classes. I’m wondering if you know how to add a caption to an image on the WordPress app? I’m not having a problem coming up with captions, but I am having major issues with the font and color of the words in the captions. How do I edit this? You can style captions by adding custom CSS to your theme. Here is some example code that you can use as an starting point. I am using Genesis theme and outreach-pro child-theme. I enter captions for images and they display in the editing mode view. When I go to my actual site, the caption is missing. I need to add captions for some, but not all, images. Please help. Please try your theme’s support forums. Alternately, you can also use a WordPress gallery plugin to achieve this. How do I get my site to show the captions after they are added? I have added the captions to the pictures under media but they don’t show when I look at the site. They only show when I hover over the pictures. I want to embed some text into a photo on my website. Please advise how to do this. By speaking slower and more clearly at might help the beginners a little bit more. You run over the words, so to speak ” rattle off”!! Not a good idea for them who just start wordpress! Thanks for this article and all your other helpful articles. Can you recommend any tips to add this type of info for each picture on my site that helps SEO? You go much too fast. Your videos are almost no help at all because you rush through everything. You have to remember that the people you’re trying to reach are beginners. We don’t know what we’re doing. That’s why we’re relying on you. We will try to work on that. Thanks for your feedback. That’s a good idea, we will try to cover this in a future article. How can we change the fonts, colour, style of the captions? Is there a character limit for captions? Very helpful video. Short and to the point. Thanks. Hello I have added captions to photo files on my computer. Is it possible to upload the photos including the captions to a WordPress blog, or do I need to copy and paste the captions from the metadata of the photos into WordPress? Hi – I have a good background picture on my homepage – bkgd position 70px 0px, bkgd size cover. But I can’t seem to get the same on my other pages as it asks for scale or pixels – I’ve tried resizing on paint but no matter what to it appears too big. – that’s my 1st problem. 2. using 2014 theme – child – where do I find the code for the pages ? I’ve looked in 2014 parent theme style.css but can’t make out if the code in there belongs to the parent or child — I’ve checked the color codes and they seem to belong to the parent theme – so where will I find the code for my pages – I am tearing my hair out , I’ve been at this for months and no one can give me an answer! – I’m learning php, html, java, just to find them to no avail. 3. I have my title in my homepage (which is my url – But I wish to change the last word to suit all my other pages – any chance you have a code for this and where would I add it. Wondering whether it’s possible to have the caption appear with the photos when they’re clicked on and open in the lightbox. That way, when people continue scrolling through the photos, the captions continue to appear. Great. Clear direction. Immediately began ‘captioning’ my many photos on my blogs. Question: Sometimes when I add a caption to a photo in some themes, it will make it appear a little wonky. A border box will appear off-center. What should I look for in the CSS to fix this? Thanks, very useful as I work on my first blog.